Watch: Is Juncker imitating Theresa May's ABBA dance moves? EU Commision President Jean-Claude Juncker appeared to channel British Prime Minister Theresa May's dance to ABBA with moves of his own this afternoon. 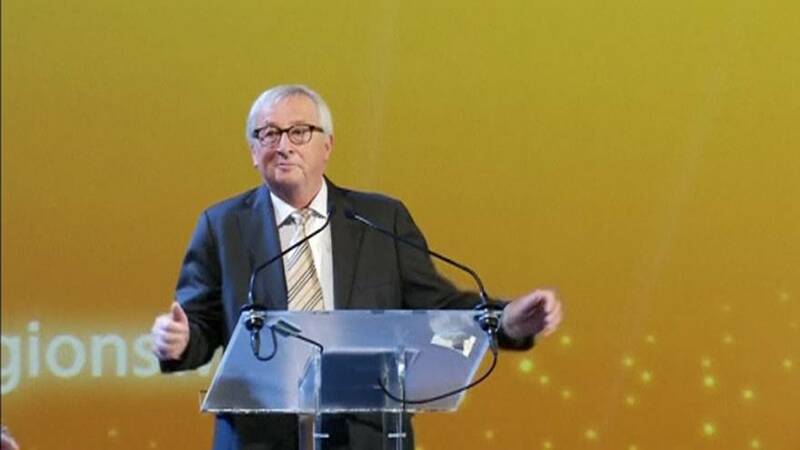 Juncker appeared to imitate May's now-famous entrance to the Conservative Party Conference stage where she grooved to ABBA's Dancing Queen. Juncker's moves sparked a laugh among those in attendance before he began his speech in Brussels. A spokesman for Juncker said that his improvised moves were "not directed at anyone" while reiterating the EU Chief's previous comments that he has "great respect" for May. The EU and May's Conservative Party have been at loggerheads while struggling to secure a Brexit Exit plan. May made a speech to her Conservative Party Wednesday after coming under fire for her proposed "Chequers" Brexit plan which was heavily criticised by the EU and Brexiteers. The Northern Ireland border has remained the main stumbling block to negotiations with Juncker looking for Northern Ireland to remain within the single market, a suggestion Brexiteers strongly dismiss.